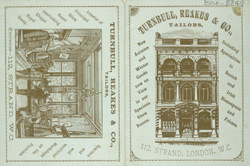 The 19th century helped to establish the importance of the suit in men’s wardrobes, and colour began to be played down. Black jackets were generally worn with white shirts. This more sombre colouring was a sign of the more practical and industrial age that Britain was entering. Mass produced clothing meant suits were more affordable, and the use of lighter materials such as flannel meant that clothing was less formal and more flexible. This was important in an era where the social and sporting worlds began to link up with the worlds of industry and business.